You should have received a delivery email from us with your HTM signature file(s) attached. Right-click on one of the attached HTM signature files and choose “Save as” or “Save all attachments…” from the drop-down. Save to your desktop or a folder of your choice. You can also simply drag these files to the appropriate folder. 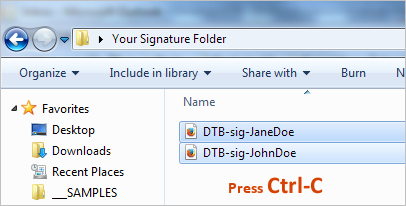 Navigate to the folder where you just saved your signature file(s). Select the files you wish to use. To select all of them, press Ctrl-A (press the “Ctrl” key and the “A” key at the same time). Now with your selected files highlighted in blue, press Ctrl-C (press the “Ctrl” key and the “C” key at the same time) to copy them. The folder that stores your signature files will open. Step 2. Press “ Ctrl-V” or RIGHT click and choose PASTE to paste your signature file(s) into this folder. Step 4. You’ll now see the signature you just saved in your list of existing signatures. 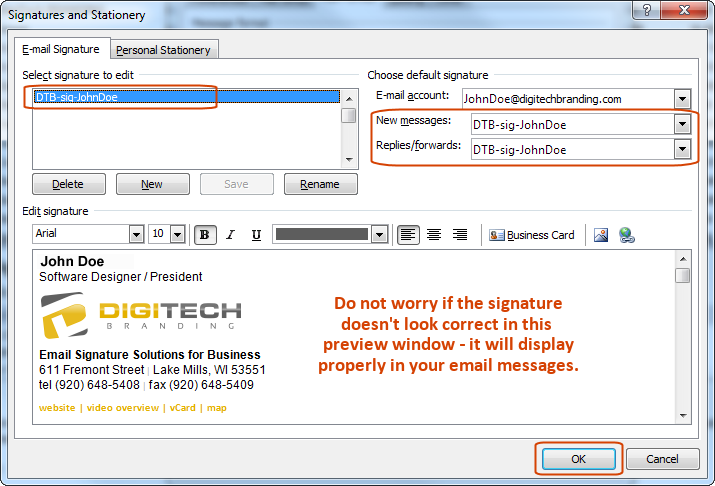 Set this signature as your default signature for new messages and for replies, save your settings and exit the signature dialog. You’re now finished installing your signature.